Nottinghamshire batsman Greg Smith has joined Leicestershire on a two match LV= County Championship loan. The 26-year-old right-hander, who has played nine first team matches in all competitions for Notts so far this season, will feature for his former county against Kent starting on Sunday, followed by a further four day fixture against Gloucestershire. 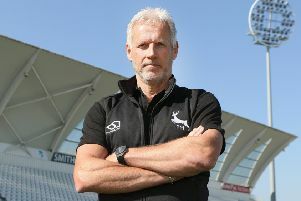 “Greg hasn’t featured in our four-day side recently and first team cricket will be much better preparation for when we do need him,” said Nottinghamshire Director of Cricket Mick Newell. Smith, who scored 138 off 132 balls in the recent Second XI 50-over fixture against Derbyshire, remains available for the Outlaws in limited-overs cricket.